QOM, Iran—In a dusty brown village outside this Shiite holy city, a once-humble yellow-brick mosque is undergoing a furious expansion. Cranes hover over two soaring concrete minarets and the pointed arches of a vast new enclosure. Buses pour into a freshly asphalted parking lot to deliver waves of pilgrims. The expansion is driven by an apocalyptic vision: that Shiite Islam's long-hidden 12th Imam, or Mahdi, will soon emerge—possibly at the mosque of Jamkaran—to inaugurate the end of the world. The man who provided $20 million to prepare the shrine for that moment, Iranian President Mahmoud Ahmadinejad, has reportedly told his cabinet that he expects the Mahdi to arrive within the next two years. Mehdi Karrubi, a rival cleric, has reported that Ahmadinejad ordered that his government's platform be deposited in a well at Jamkaran where the faithful leave messages for the hidden imam. Such gestures are one reason some Iranian clerics quietly say they are worried about a leader who has become the foremost public advocate of Iran's nuclear program. "Some of us can understand why you in the West would be concerned," a young mullah here told me last week. "We, too, wonder about the intentions of those who are controlling this nuclear work." Qom is a place where the possible ends of Iran's slowly crumbling Islamic regime can be glimpsed—both the catastrophic and the potentially benign. There is the rising, officially nurtured last-days cult at Jamkaran, and the extremist rants of Ahmadinejad's own spiritual adviser, Ayatollah Taqi Mesbah-Yazdi, who recently suggested that future elections were superfluous because a true Islamic government had arisen. has taken to regaling his inner circle with a startling anecdote from his travels around the country to bolster domestic support for a nuclear programme that has generated vociferous international opposition. Flying back to Tehran one day from a western province, he realised that he would not reach the capital in time for a scheduled prayer and ordered his helicopter pilot to land. As Ahmadinejad tells it, he had just laid out his prayer mat on the flat, fertile terrain of rural Zanjan when three shepherds appeared and began to chant. "Nuclear power is our inalienable right," they cried in faithful unison. Immediately upon assuming the presidency, Ahmadinejad began to assert his belief in the imminent return of the Mahdi as the basis for his political activities. Despite the traditional belief that no one can foresee the hour of the Mahdi's return, Ahmadinejad frequently stated that his coming was nigh. ... Not only has Ahmadinejad wished to proclaim the imminent coming of the Mahdi, and thereby to legitimize his policy and actions by associating them with Hidden Imam - but he has also presented himself as being directly connected to God. ... The messianic doctrine of Mahdism is also manifest in Iranian foreign policy, especially in its attitude towards the Western superpowers and towards the nuclear program. Contemporary Islamic fundamentalism in Iran—and even generally in the Islamic world—finds its representatives not in the traditional seminaries but among modern educated engineers and doctors. One of the remarkable consequences of this fact for Western policy makers is that while Shiite traditionalist theologians are thinking and acting within a specific theological framework which makes their behavior highly predictable, the new fundamentalists do not follow any established theological system and model. Therefore, understanding their rationale as well as predicting their political actions becomes very difficult. May 20, 2008 update: Nazila Fathi writes from Tehran that "Iranian Clerics Tell the President to Leave the Theology to Them." Among the issues involved are Ahmadinejad's goal to "hasten the emergence" of the mahdi. In response, he used a news conference last week, to criticize those who were "insulting and mocking" him about mahdaviat. "To deny the help of the imam is very bad. It is very bad to say that the imam will not emerge for another few hundred years; who are you to say that?" Also in a speech last month, he claimed that the mahdi directed his government and helped him face international pressure. He said he had the imam's hidden support when he gave a speech at Columbia University in New York last September and was insulted by the president of the university. With Imam Mahdi's support, he said, 500 million people watched him on television. Mr. Ahmadinejad also said the United States had attacked Iraq because it had found out that "the divine hand" — apparently a reference to Imam Mahdi — was going to emerge there. by linking his government to Imam Mahdi, he was trying to deflect criticism of his economic policies, which have led to double-digit inflation. A senior conservative cleric, Ayatollah Muhammad Reza Mahdavi Kani, warned him weeks ago not to talk about Imam Mahdi and said that even the founder of the 1979 Islamic Revolution, Ayatollah Ruhollah Khomeini, did not claim any links with the imam. Another cleric, Mehdi Karroubi, who ran for president when Mr. Ahmadinejad was elected in 2005, warned that people could lose their faith in Imam Mahdi. "People would say that if the current situation is his management before his emergence, what would happen after his emergence?" he said, referring to soaring food prices, the daily newspaper Etemad Melli quoted him as saying. "We need to talk about realities," said Mr. Karroubi, who is a former speaker of Parliament. "We should not link everything to religious and hidden issues." Ayatollah Mohammad Bagher Kharrazi, head of the Hezbollah political party in Iran. May 15, 2010 update: Another of the ruling elite. Ayatollah Mohammad Bagher Kharrazi, head of the Hezbollah political party, has specific ideas about bringing on the end of days, reports Ali Akbar Dareini from Tehran. He called yesterday for the creation of an "Islamic United States" or "Greater Iran" to rule over the entire Middle East (including Israel, of course) and Central Asia, an event he sees heralding the coming of the mahdi. "The Islamic United States will be an introduction to the formation of the global village of the oppressed and that will be a prelude to the single global rule of the mahdi." Based on a personal interview with an anonymous source, Naji states that Ahmadinejad was a member of the Hojatieh (p.15), a secretive group established in 1953, which was fiercely anti-Bahai, anti-communist, and was obsessed with the arrival of the 12th Shia Imam, Mahdi. The Hojatieh had secret meetings, secret publications, and even a secret intelligence group tasked to infiltrate other groups. The Hojatieh did not believe in Khomeini's notion of the desirability of establishing an Islamic government. Instead it wanted to see the arrival of the 12th Imam. It also believed that chaos in the world would be a pre-condition for the arrival of the Shia messiah. Many members of the Hojatieh left the group and joined Khomeini during and after the revolution. Many high officials in the Islamic Republic were members of the Hojatieh, but want to keep that information secret. Ahmadinejad has not admitted that he was a member of the Hojatieh. However, Ahmadinejad's obsession about the 12th Imam is consistent with Hojatieh beliefs, as is his belief in the 12th Imam's imminent arrival. Naji discusses Ahmadinejad's views on the 12th Imam and their political ramifications for Iran's nuclear programme. Many believe that the arrival of the 12th Imam could be hastened by creating chaos and thus compelling the Imam's intervention on behalf of the Shia faithful and against the infidels. There is little doubt that Ahmadinejad's presidency brought this relatively marginal perspective to a prominent place in Iranian politics. Since his presidency, the preoccupation with the 12th Imam and the belief in his imminent return have reached heights unprecedented in recent history. Many of Ahmadinejad's close associates and supporters believe that there was a divine nature to Ahmadinejad's victory. Ahmadinejad himself believes that he has a divine mission. He even claimed that he felt a halo surround his head while delivering a speech at the UN General Assembly, although later Ahmadinejad denied saying this despite his statement being captured on video. A combination of open millenarian thoughts and secrecy as well as rumours and denials create a volatile atmosphere in Iranian politics. This, added to the secret nuclear programme, has caused great concern. 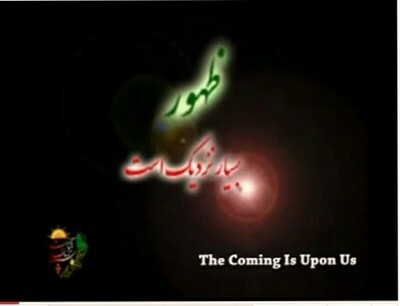 Screen shot of the title, "The Coming Is Upon Us," of an Ahmadinejad-related documentary. Signs of the end times abound, the film states. These include: great earthquakes, sedition, and the rise of evil world leaders (depicted are George W. Bush, President Obama, Israeli Prime Minister Netanyahu, German Chancellor Merkel, among others). Even worse: "Women will rid themselves of the Hijab," the Islamic head covering many young Iranian women threw off during anti-government protests in 2009. "Adultery will become common. Men will dress like women. Men will content themselves to men and woman to woman." The people of Egypt "will rise up against their ruler"
Jews will re-establish a government in Palestine, and the Muslims will be "separated from one another and be disunited"
For further details as well as a 28-minute shortened version of the film with English subtitles, go to Kahlili's website. The issue of Imam Mahdi is of utmost importance, and his reappearance has been clearly stated in our holy religion of Islam. We must study and remind ourselves of the end of times and Imam Mahdi's era. … We must prepare the environment for the coming so that the great leader will come. Today we have a duty to prepare for the coming. … If we are the soldiers of the 12th imam, then we must be ready to fight. With the guidance of Allah and His invisible help, we shall make the Islamic civilization proud on the world stage. … This is our destiny. … The youth, the faithful must prepare themselves for this great move. There will come a time when all the oppressive powers of the world will be destroyed and humanity will be enlightened in the era of Imam Mahdi. Jan. 25, 2013 update: Mohammad Reza Heydari, a former Iranian diplomat who defected in 2010, went on Israel's Channel 2 TV and said that regime leaders "are busying themselves with ideological preparations for the arrival of the hidden Imam and are preparing the ground for that in a practical way; for this purpose, they are willing to spill much blood and destroy many countries." Jan. 31, 2013 update: Ali Saidi, Khamene'i's representative Pasdaran said that one way of bringing about the arrival of the Mahdi "is by preparing upheaval in the Middle East; so long as there is not total upheaval in Middle East then the Imam of the Era [the Mahdi] will not arrive. … Before the arrival of [the Mahdi] we needed a Mahdi government, and the Iranian Islamic Revolution is along the path of the arrival of Imam of the Era." Sep. 12, 2013 update: The mahdaviat phenomenon has also gripped Hassan Nasrallah, the leader of Hizbullah, according to a report, "Is Hezbollah's Syria Approach Tied To Shiite End-Times Doctrine?" in Al-Monitor. Nasrallah is known for being a strong believer, as well as for his confidence that the great war in the region between Iran, Syria and Hezbollah is bound to occur and that the camp he is allied with will be victorious, even if the human and material costs are quite high. Nasrallah, as well as the Iranians surrounding the leader of Islamic Revolution Ali Khamenei, rely on facts contained in a religious book to demonstrate the inevitable Great War with Israel. They believe that this mystical book, called the Al-Jafr, tells them about the future and forthcoming events. Supporters of the Shiite Islamic Revolution, in Iran and all over the world, believe that this book was written by Imam Ali ibn Abi Talib and inherited from him by Jafar al-Sadiq. It is worth mentioning that according to Shiite credence, Ali ibn Abi Talib was supposed to be the caliph following the death of Prophet Muhammad, but this never happened. Al-Jafr is a kind of science based on the knowledge of the unseen and on the science of huruf (letters of the alphabet) to predict facts that will occur in the future, leading up to Judgment Day. Al-Jafr is a series of old symbolic events, whose interpretation explains the nature of the events that will take place before Judgment Day. According to Shiites, this day will occur with the advent of the Imam Mahdi, the Redeemer, whose arrival is awaited for by the Shiites. The Mahdi is expected to achieve justice on earth, grant victory to Islam and defeat unbelievers. The most important matter examined by the strongest interpreters of Al-Jafr — the interpreters from among Hezbollah and Iran who deduce the meanings from words or events — is to determine the occurrence of events cited in this book, which are deemed as signs preceding the reappearance of the Mahdi after the occultation. Shiites refer to these awaited events as "signs of reappearance." According to Al-Jafr, the occurrence of major bloodbaths in Syria is one of the most prominent signs of reappearance. Moreover, according to the interpretation of Al-Jafr, the ruler of Syria will be killed within the scope of these events, and then the country will be ruled by a Sunni leader who will persecute Shiites, Alawites and Christians. This will continue until an army from the East (i.e. from Iran through Iraq) intervenes and kills the unjust ruler and liberates Syria. This army will keep marching toward Jerusalem to liberate it from the Jews. There, Imam Mahdi will appear to pray in Jerusalem along with the messiah. This is the scene where the earthly time comes to an end and the divine era — where justice, fairness and peace prevail — will start. Nowadays, Iranians and Hezbollah are holding their breath, waiting for the aftermath of the US strike on Syria. They are confident that the predictions contained in Al-Jafr are coming to pass. They believe the countdown for the realization of the mystical scenario drawn in Al-Jafr has begun. Moreover, by comparing the predictions in Al-Jafr and the sequence of events over the past two years, one may reckon that those who believe in this holy book have grown more confident in its predictions. In two years, Syria has witnessed bloody events that no one expected. After Obama's threats to strike Syria, Al-Jafr's predictions — that Bashar al-Assad will be killed and replaced by a Syrian Sunni leader who will retaliate against the religious sects that supported the regime, such as the Shiites, Alawites and Christians — have become more likely. All these signs indicate only one thing: the nearing appearance of Imam Mahdi. Just as the world sees these events as political, the supporters of the Islamic Revolution in Iran view them as historical events that were cited in Al-Jafr and described as mere signs preceding the reappearance of Mahdi, according to the Shiite belief. Apart from these incidents in the Levant, these signs include the death or assassination of the Saudi king. In this sense, the flared-up fronts and consecutive bloody events predicted by Al-Jafr seem to be in the process of fulfillment. According to Shiites who believe in this book, mainly Khamenei and Nasrallah, there is one possible explanation. The signs of reappearance of Mahdi are being successively unveiled, and the Great War with Israel and the disbelievers is just around the corner. All hopes are hanging on that nearing moment, when the victorious Shiites and Christians will stand in long lines while repeating the prayer of victory in Jerusalem following the Imam Mahdi and the messiah.